WOW! 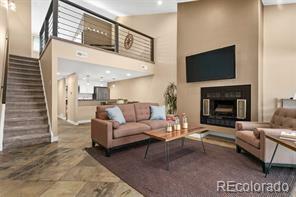 Fully remodeled 2 story condo with brand new kitchen (cabinets, appliances, lighting, the works!) and 2 new baths (full, 3/4). . . plus a 1 stall garage AND a view of the pool! High-quality updates by a long-time owner. . . not a flip! Dramatic vaulted ceilings and open floor plan with a wood-burning fireplace for chilly winter nights. . . and Central A/C for summer comfort. Enjoy morning coffee or a glass of wine on either of 2 balconies--one off the living room and one off the master, overlooking the pool. Contemporary loft area offers great flexibility--a 2nd bedroom (w/ private bath and closet), a home office, gym, hobby area and more. And if you have a furry friend to live with, a special area under the stairs is all set for a bed for Fido or Fluffy. Offers are welcome anytime but no later than Monday, March 5 at 10am. Response by March 6 at 10am. Listing agent includes a 1 year American Home Shield warranty at closing. Open houses Sat 10-4 and Sunday 10-4pm.